CZ OEM magazine release spring. Consider a #35 retaining screw when replacing this spring. Fits all CZ's and Canik. CZ OEM firing pin block lifter, fits all CZ's with a firing pin block. Don't forget to get a #15 lifter spring (CGW L-Spring). CZ OEM plunger spring used in all firing pin block equipped 75 series CZ's, including P07 & Po9. CZ OEM firing pin spring for all 75 full size, compacts, P-01, PCR, 85B, 40B, RAMI, 97B/BD, etc. NOTE: Does not fit P07 P09. "Made in USA" extractor spring for all 75 full size, compacts, Shadow, 85B & 85C, P-01, PCR, 40B, 97B-BD, etc. Does not fit P07 P09. CZ OEM extractor pin fits all 75 full size, compacts, Shadow, 85B & 85C, P-01, PCR, 40B, 97B-BD, P-01 and 75B Omega, etc. Fits all CZ's and Canik's that use a parallel dovetailed front sight that is retained with a front sight cross pin. 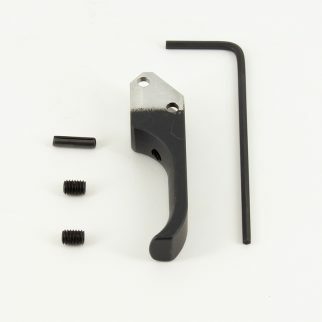 CZ OEM screw that retains the trigger bar support spring and mag spring, fits all 75 full size, compacts, Shadow, 85B & 85C, P-01, PCR, 40B, 97B-BD, etc.